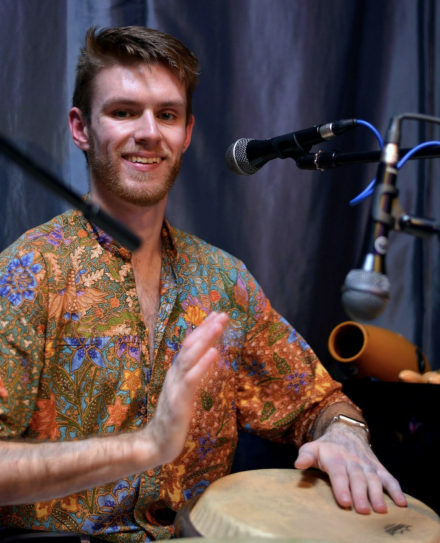 Kevin Mott is a diverse percussionist who can do it all. He received his bachelor’s degree in Percussion Performance from the University of Delaware and his master’s degree in Percussion Performance at the Indiana University Jacobs School of Music. As a percussionist he specializes in world percussion, specifically from Latin America, but can teach a wide variety of instrument. These include Congas, Timbales, Bongo, Drum Set, Marimba, Xylophone, Steel Pan, Snare Drum, Timpani, and auxiliary percussion instruments from both the orchestral and world genres. On top of teaching he has been designing and building Marimbas and Xylophones with his father since 2010. Kevin has had the honor of playing around the world with various ensembles including the Jerusalem Symphony Orchestra, Supernova’s Steel band from Trinidad and Tobago, the Delaware Steel Band, and the University of Delaware Wind Ensemble. On top of his playing opportunities he has been able to help bridge cultural gaps both at home and abroad. Most notably with the Peace Drums Project in Israel, led by Harvey Price, in the spring of 2015 as well as introducing the steel pan to Vienna in 2014 alongside the Delaware Steel Band.